Okay so we admit this a bit of a clickbait title. Our argument is that as a commercial solar firm you need to be investing in your own lead generation systems using your brand’s assets. The fact is when a local water district, agriculture company, or enterprise manufacturing firm begin to research how they transition to a $1m+ renewable energy system, it’s a serious investment with many considerations, requiring an extensive sales process. Most solar design & installation firms understand very well who they want to speak too and what questions to ask. However many lack the knowledge of how to corral digital channels to generate consistent commercial solar inbounds at scale. We are using a combination of channels that are integrated. We first define our audiences and build relevant assets specific to that industry like video testimonials, case studies, and a landing page template we can replicate across campaigns. 2) FB ads – We target a specific industry but generally needs a to be a multi state campaign to have a big enough audience size for FB to work best, but you could perhaps make it work making a general campaign targeting business owners for smaller states. 3) LinkedIn – we export lists of specific industry decision makers we want to target in our geo (charter schools, hospitals…etc) build an industry specific lander + case study, and automate our outreach. 4) Cold email – same automated process as LinkedIn except using email. Keeping in mind, all of our landers and websites have our FB pixel installed so we can retarget all the traffic that’s visited our site or landing pages. Step 1: Segment and Define Our Personas. We see this preached everywhere. “Develop a persona.” It’s cliche but it’s a critical exercise often overlooked or rushed through by solar firms. This marketing 101 exercise later helps us develop highly targeted messaging and offers that will better resonate with our audiences and break from the staleness of our competition. It may even stimulate repositioning ideas: “We are California’s #1 Solar Energy Provider for Water Districts”. By defining who it is we want to target, internalizing their experiences, education, backgrounds, behaviors, political leanings..etc, helps us better understand their risk aversion and how to address this in our marketing. 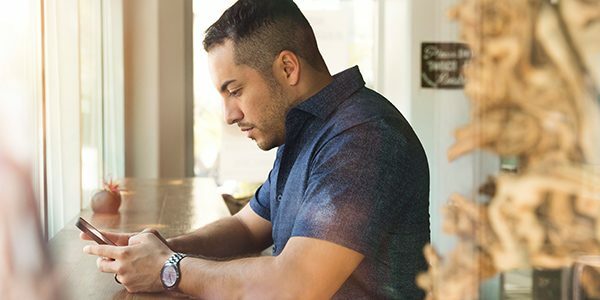 It forces us to visualize and best understand the emotional toll and barriers these business owners and CFO’s are experiencing when their operations are spending too much on ever increasing energy costs. The more specific we get, the more accurate our personas. The more accurate our personas, the better our messaging to convert prospects. These visualizations help us deliver better targeted messaging, collateral, and offers to drive some type of action when someone comes across our brand for the 1st or 10th time. Your sales team is acutely aware of common pain points and objections. Document these on paper and develop a page that address each. Take an executive out to lunch. Find out exactly what adversity these industries face, why perhaps some are more restricted to capital than others, and how you can provide the opportunity to overcome the adversity. *Tip – Take a survey of all your past clients to develop some hard stats in your marketing. Just begin by developing a process for defining your 1-3 top buyers. Immediately this will being to reshape your marketing. Here is a worksheet to help you get started. Step 2: Developing Marketing Collateral for Our Personas. As you may have began to notice, these steps build on each other. Now that we’ve established common buyer personas, have a basic value ladder, we can begin to visualize each of their customer journey, and craft marketing collateral that provides value at each stage of their journey. Let’s go back to our Government/municipality persona example. The fact is the solar industry’s top commercial firms have already done most of the leg work for us on who to segment and target. Let’s begin to look at all the marketing collateral and industry specific pages SunPower has developed to target local municipalities. Let’s start with a “solar for water districts” type of search. b. 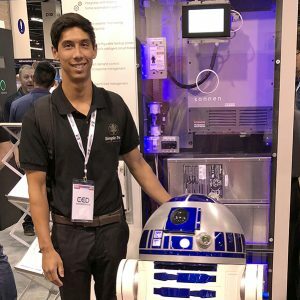 This blog post has multiple internal links to their government solar page. 3 PDFs – 1 for their Roof mount Product, 1 for their Ground mount product, and One sales flyer for Government community solutions. This is just glancing at their assets for government commercial solar, not even delving into their 10 other segmentations for commercial. Is a lead gen provider going to match this much marketing investment in content specific to your brand and clients? No. Is this a lot of work? Yes and no. Is the investment worth it? Absolutely. However we can save considerable time by reverse engineering what our competitors are already doing, and improving upon it with our own editorial production system and a clear path for their placement and distribution. We love using clickfunnels as it’s a really easy way to duplicate high converting landing pages across industries and iterate on which landers convert. The fact is these industry pages, videos, PDFs, and case studies can be multi-purposed for increased traffic and leads. Robust topical pages helps our SEO (google loves site’s with page depth). These same assets can be repurposed for retargeting ads, lead magnets,, display ads, guest posts for link building…etc. It’s as simple as having a process in place for developing similar content unique to your firm, and having a clear path forward for ranking and distributing this content to attract leads. This is a client of ours who put together some really nice testimonials videos from their Church clients. 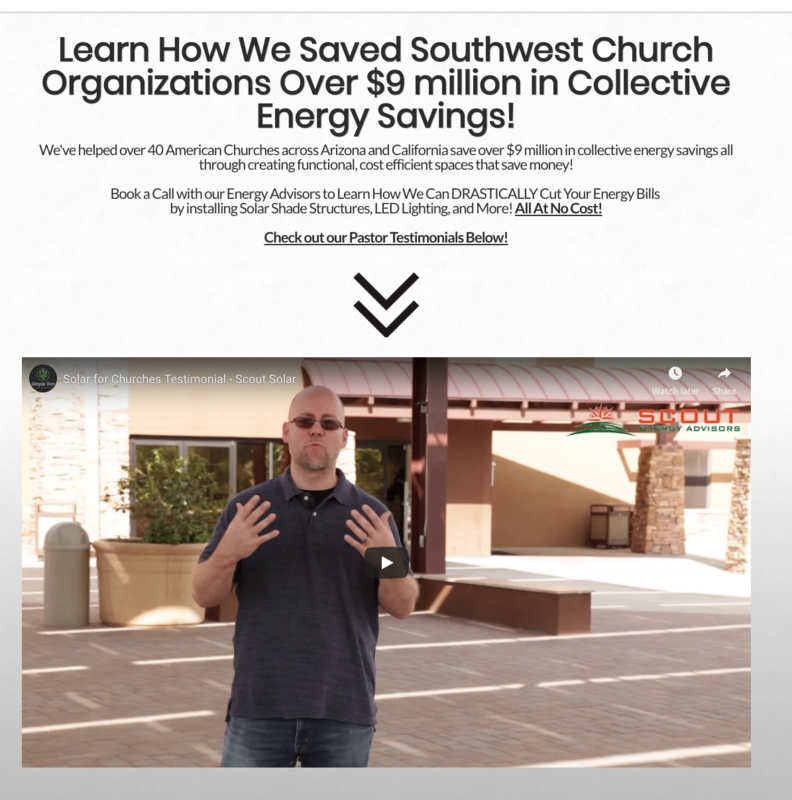 We then built a landing page using these video testimonials with a specific call to action targeting Churches. The Low Hanging Fruit: Common topical content which can easily be emulated from competitors. Again, we want our site to be the encyclopedia for all things commercial solar. Google loves sites with page depth and topical relevancy. The High Hanging Fruit: Unique brand specific, research pieces like case studies or reports are your most powerful assets for link building and lead magnets. We suggest saving these high value proprietary types of content as lead magnet bait, or finding a blend in between both. b) Topical content that gives our website more relevancy surrounding solar. 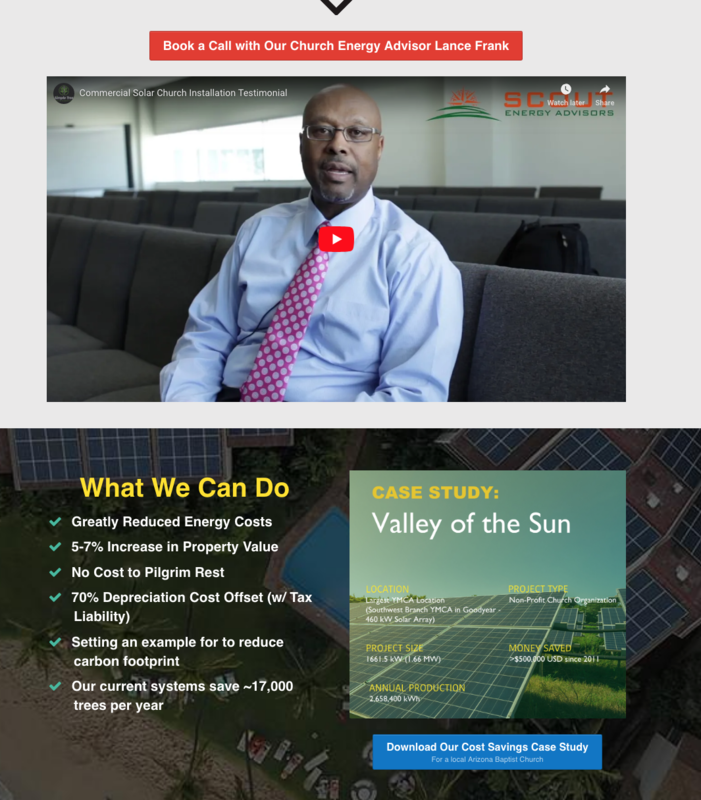 Here’s an example Lead Magnet we helped REC Solar develop and distribute that’s helped generate 100s of new email leads from prospective businesses and admittedly students as well. Their team wrote the e-book, we built a targeted landing page that requires a user’s email to access the ebook. We then distributed this content targeting both our Facebook Pixel’s past website traffic, and creating a Look-a-like Audience from our existing past website visitor audience. Next we promoted this same e-book with Linkedin Ads targeting enterprise manufacturing. 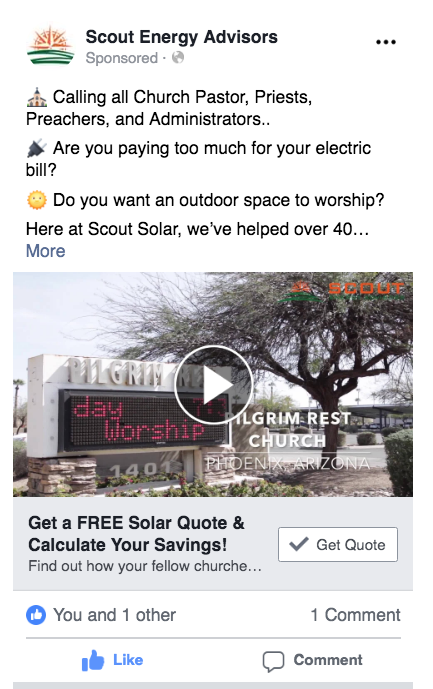 We love Facebook ads for both resi and commercial solar leads. 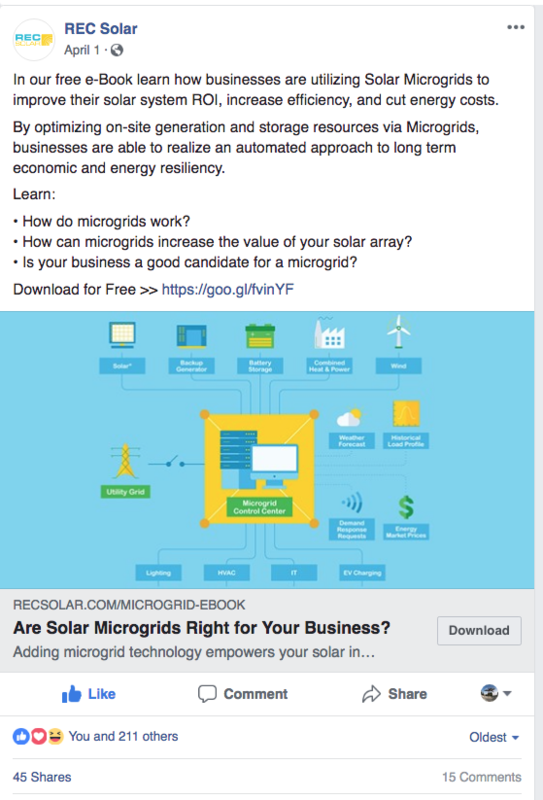 Commercial solar is a bit more complex of an animal to tame on FB. Really all it requires is a targeted audience, and a wide enough service area so our audience size is big enough. Generally we need multi-state campaigns aside from the very big states like California. Additionally we need to be more strategic about what kinds of industries we’re going to target on FB. It’s going to be a lot more difficult to target city officials on Facebook compared to a group like Church pastors. So it’s a combination of choosing an industry we can easily target that will give us the biggest audience size as possible to let Facebook do the heavy lifting and find which groups will convert into commercial solar inbounds and leads. These are some core solar in-bound channels we leverage once we’ve successful developed our marketing collateral built upon our personas and value ladder. The keyword research stage predicates all of our SEO tactics and makes our site a robust, long term lead generating asset. We can build and optimize pages that target searches from our specific industries i.e. “Agriculture Solar”, “Solar for Schools”, “Solar for Hotels”…etc. Sure compared to Residential solar search volume is lower, but so is the competition. We can build out geographic service pages that go after search terms with actual volume “commercial solar orange county”…etc. Once your marketing team has a basic understanding of SEO best practices and has seen it implemented, it’s easy to progress quickly as you know how and what type of content to build going forward. If you’re a local or regional provider Google Maps is one of the most important channel to invest in. Your website’s organic rankings often work in parallel with your GMB listing. A higher ranking website will rank your GMB listing higher and vice versus. Generating reviews and ranking in the 3 pack for your B2B solar types of keywords requires a specific set of niche + geo-reinforcing strategies. For REC Solar, we built out simple city pages to go after large metro areas like San Diego and Fresno. Took less than a month for these pages to reach the first page (since they’re backlink profile is so powerful). After tweaking the page copy for over-optimization and adding in other geo communicators like embedding a Geo + KW Titled YouTube videos and outbound links to Chamber of Commerce sites or other geo-oriented sites to help convey geographic relevance they’re city pages are now in the top 3 of organic results without having any physical office or local address data. An email drip system is simply a series of emails that predicate the voluntary exchange of contact information (email) in exchange for a bribe. Generally a targeted piece of content. These can nurture cold leads into call appointments or form fills by allowing you tastefully communicate relevance and expertise that provide solutions to their problems (or perhaps making them aware of a problem they didn’t know existed). Email Narratives build a relationship immediately as these emails convey a personality and voice. This system helps us leverage more out all our traffic sources when we have a tasty carrot our persona’s can’t deny in exchange for an email. We then have a sequence ready to fire off to these segmented recipients (we segment our B2B solar email lists based on industry) to continue to deliver targeted value with low-sell call to actions in between. You can leverage a lot more out of paid search when we’ve established our personas/lead magnets and email drip system ready to go. Targeted landing pages with useful sitelinks and ad extensions can help drive more conversions and CPC down for competitive keywords like “commercial solar” and “commercial solar financing”. *Tip – Going after competitor brands is an easy shortcut to get in front of prospects who already have buyer intent, with generally lower cost per clicks. Pretty excited at how amazing this outreach process works for getting in front of B2B decision makers. The fact is these guys love to hang out on LinkedIn, many who have the app on their phone. LinkedIn Sales Navigator is a powerful tool to develop targeted lists off your personas. This process is very new that many solar firms aren’t leveraging, and is extremely powerful for reaching super targeted B2B prospects. For example with Linkedin Sales Navigator, we can look up Water Districts, save the leads of decision makers and their emails (contact us and we can explain further), and begin a cold outreach campaign. We are in a great position however to pitch our offers, as we have industry specific case studies, testimonials, offers…etc ready to fire off from our cleaned up LinkedIn lists. Often we can use the same email drip sequence of emails or modify it slightly to speak to our target personas. Contact us to learn more about this super powerful strategy not many commercial solar firms are using. These are less impactful at driving direct in-bound leads, but are still key drivers for brand awareness and increased touch points. If we have enough traffic coming to our website we can retarget these existing visitors based on specific pages they visited or even import an email list to drive ads toward and reinforce touch points. We’ve found it’s very hard to reach B2B solar leads through cold interest/demographic types of audiences. But with the right offer, in front of the right audience, Facebook ads can be great tools for building your email lists. LinkedIn Ads are a great way to pitch your lead magnets (with email drip system ready to go) to specific industry types and personas. It’s similar to Facebook Ads in that we are interrupting a user’s browsing (rather than them intentionally searching for a solution), and need to convince them we’re worth their time with a highly targeted piece of content that speaks to them directly. Same principle, running YouTube ads toward our retargeting traffic. Generally not direct lead drivers but if the budget is there, a great supplemental channel to brand awareness. Podcasts are becoming increasingly more popular for brand awareness and lead generation. They require a few months minimum of new shows to gain momentum, and of course a willing host in your organization who is well spoken and educated to deliver interesting shows, as well as the maangement aspect of finding interviewees of attending your show. However the results can be massive, as a very qualified lead could stumble upon any of one of your past shows, and ignite the trigger to contact your firm. We can go on and on and delve much further into each channel. But hopefully you understand part of our process, and how we’re able to leverage more out of each traffic source to drive and nurture in-bound leads while standing apart from the competition. Would You Like Feedback On Your Solar Marketing? We provide detailed In-bound Lead Generation Blueprints specific to your commercial solar firm. Request a Blueprint or Schedule a Call with Doug.